WASHINGTON — The District is set to lay out new rules this month for dockless bikes and app-based electric scooters. The pilot program that started last year was extended through Aug. 31 after the companies that run the services complained about an initial proposal this spring that would have required payments to the city, continued data sharing and that the dockless rides be parked in proper areas. 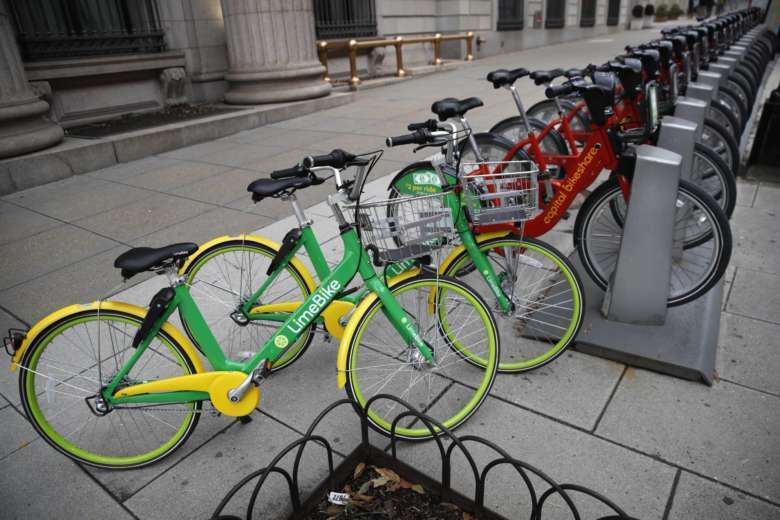 Some bike advocates had also complained the regulations could have limited the usefulness of dockless bikes and scooters for people who visit, live or work in the city. Though some advocates have asked that the city allow thousands more bikes as part of the program, a number of District residents have complained that the bikes and scooters simply litter sidewalks in the best of circumstances, while some end up trashed down alleys or hillsides in others. “There will be changes that reflect those comments and the feedback that we’ve gotten from the public,” said District Department of Transportation Director Jeff Marootian. Under the current pilot, there are no fees, but there are also strict limits on the number of bikes or scooters each company is permitted to operate in the city. Various companies charge between $1 and $2 to start a trip, with additional fees possible based on how long a trip takes. Some of the companies have scaled back operations in the city this year. “We expect to have a way forward, beyond that [pilot], available to the public very soon,” Marootian said. When the pilot began, it was focused on dockless bikes, but the city now has a significant number of motorized scooters as part of the program. “The technology in and of itself has changed, and I expect that the regulations and the way that we move forward with this project will reflect not only the public’s feedback but also the change in the technology as well,” Marootian said. DDOT has been reviewing the feedback, including surveys, and usage data provided by the companies to determine the new policies. “I expect that we’ll be sharing those plans very soon,” Marootian said. Montgomery County, Maryland, has also allowed some dockless services in the Silver Spring area. Arlington County, Virginia, expects to implement its own pilot program this fall after scooter operator Bird attempted a guerrilla launch.